I couldn't do this without you guys. Thanks so much for all the support after my last post. It helps more than you can possibly know. Thank you, from the bottom of my heart. So Friday was my endo appointment. Thursday night, I was due for a set change. Which I did. Fast forward to 4:30 am. I wake up all sweaty and gross. And my stomach hurts. I immediately reach for my Dexcom, which shows me north of 300. Apparently the glass coaster didn't make the alarms loud enough that night. A fingerstick confirms a blood sugar of 308. The stomach ache tells me I probably have ketones. Into the bathroom I go, and yep, that square turns dark pink. Moderate ketones, and a definitely defunct pump set. And an endo appointment in 4 and a half hours. Of course. Oh well. I change my set, drink some water, and go back to bed. When I finally manage to get myself out of bed at 8am, my blood sugar is 195 and the ketones are gone. Yay! But I'd better hurry if I want to get to my endo appointment on time! If you read this blog on a regular basis, then you know how much I love my endo. He's amazing. I apologized to Dr. H for my scatterbrained state, explaining my overnight adventures. He shook his head: "Ketones are no fun." And then he said, "Everything looks great! 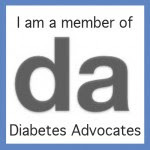 Your A1c stayed the same, which is a good thing." Wait, what? Did he just say my A1c stayed the same? Even after Thanksgiving and my battles with disordered eating? My A1c is still at a place we both agree is fantastic? Wow. Was not expecting that one, but I'll totally take it. As Dr. H shuffled through papers, I could see my Dexcom printouts. And the very high lines that I knew showed Thanksgiving weekend. As he looked at the graphs, I said, "Yeah, Thanksgiving was hard. The highs are my fault." Dr. H looked straight at me, unfazed by the high numbers. "You really do a good job." Those words stopped my self-deprecation. Broke through the guilt. He reminded me that rough patches don't undo everything. I left that appointment with a spring in my step and hope in my soul. A little encouragement makes a huge difference. Thanks Dr. H.
I love this! What a wonderful thing to hear from your doctor. What a great doctor! I did the same thing with my doctor recently, blaming myself for some of my highs. She wasn't nearly as supportive. Good job, Jess. Oh how this post makes me smile. I'm so proud of you! Something I've grown to learn over the years is that I shouldn't try to "be good" for my endo appointment (well, I should try to "be good" all the time, I suppose, but more importantly - the day of my visit should be no diferent than any other). He's there to help me, and if I can't give him an honest view of what's happening, he can't do his job. That approach as really helped to reduce my stress level in the days and hours leading up to the appointment. It sounds like you understand that, and your doctor understands that. And you're doing great. Way to go!